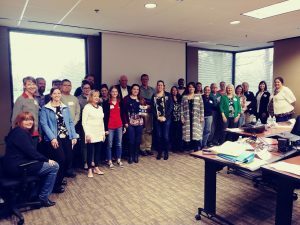 On Saturday March 16, 2019, the GVMA in conjunction with the Wellness Committee hosted the first Mental Health First Aid Course for veterinarians and support staff. Holly Pounders, a certified MHFA instructor, taught the class. Holly earned her instructor certificate for Adult Mental Health First Aid (MHFA) in August 2010 and has been actively facilitating trainings since. She is also certified to teach the Older Adult; Military, Veterans and their Families and Rural modules for the Adult curriculum. 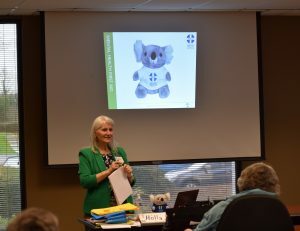 Holly became certified as a Youth Mental Health First Aid (YMHFA) instructor in October 2012 and facilitated one of the first YMHFA trainings in Georgia. The class brought to light many aspects of various mental health issues that we all may have had experience with either yourself or someone you know. According to a survey conducted by the AVMA in conjunction with the CDC in 2018, veterinarians have a high incidence of mental health issues. It is the hope of the GVMA and Wellness Committee to provide resources and knowledge to our members on methods of obtaining help and assistance.